What you are about to read is the personal inteview Dave Hull of KRLA radio (in Pasadena, Calif.) had with John (and George!) 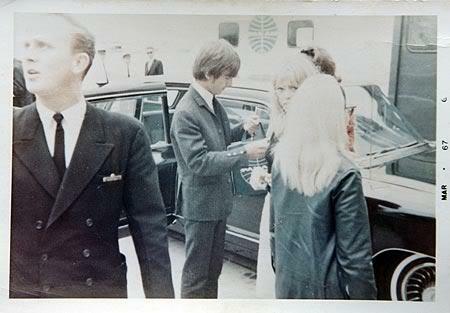 May 25th (1964) at the Los Angeles International Airport when John, George, Cynthia, and Patti Boyd [sic] were here in between changing planes from Tahiti to London. Being on his toes, Dave made it out to the airport to get this personal interview when most of the Beatlemaniacs were in school and didn't learn of this special event until after they had left. The Beatlemaniacs were really excited to hear that two of our idols were in town, but disappointed in not hearing about it sooner so they could go out to the airport to greet them. You're probably wondering why George only said two words. He was not being stuck up! If you look at the interview, notice the star (**), that is where Dave was being hauled out of the plane and George could only get those two words in before the doors slammed in Dave's face! Dave sure is lucky, isn't he? Let's all hope we can be this lucky this summer! I've got my fingers crossed! Dave: First of all, where did you come from to here? John: Tahiti. We just been there two and a half weeks on a holiday around the islands. Dave: And from here you're going back to London are you? Dave: and then go back to the States? Dave: Are you going to London first? John: After Australia, yeah I think so. I dont' know now, really. What am I gonna say? Oh yeah, we're gonna come back to do the film premiere in London and then we come to the States to do the film premiere. Dave: Where will that be? John: I don't know. I'm not sure. I'll ask George. I think it'll be Los Angeles. Oh no---Oh I don't know. I have no clue. You're asking the wrong person. Dave: I understand you're expecting. Your wife is expecting. Now, is that correct? John: It's the first time I've heard of it. We've got one, that'll do for now. We just stick him in the guitar case! Dave: Listen, you're coming from British Columbia down here when you make your engagement at the Hollywood Bowl. Dave: You'll be flying in from British Columbia. What airport? Do you know any of the reservations or anything? John: I have a clue, or anything. I don't even know where I'm going tomorrow. Dave: What about your book? Experiencing some good sales on your book? John: Well, I didn't even know it was out over here yet cause I've been away. Dave: ** Sorry, that's all right. Thank you. Dave: Bye! Thank you very much! Bye! Dave: Hello George. How about saying hi....? Dear Sara - Tomorrow will be the Feb. 7th anniversary of the Beatles and I would like to say thank you for this wonderful site and all the work/time that you put into it. I became captivated with the lads when I was 11 years old and saw them on the news and Ed Sullivan. Have been remembering them today with all the music and the Beatle experiences over the years. It saddens me that dear George, John, Cynthia, Maureen, Mal and Neil are really no longer here but this site keeps their memories alive as well as the new ones yet to come with Paul and Ringo. Thanks again. Beatles Forever. Shalom.